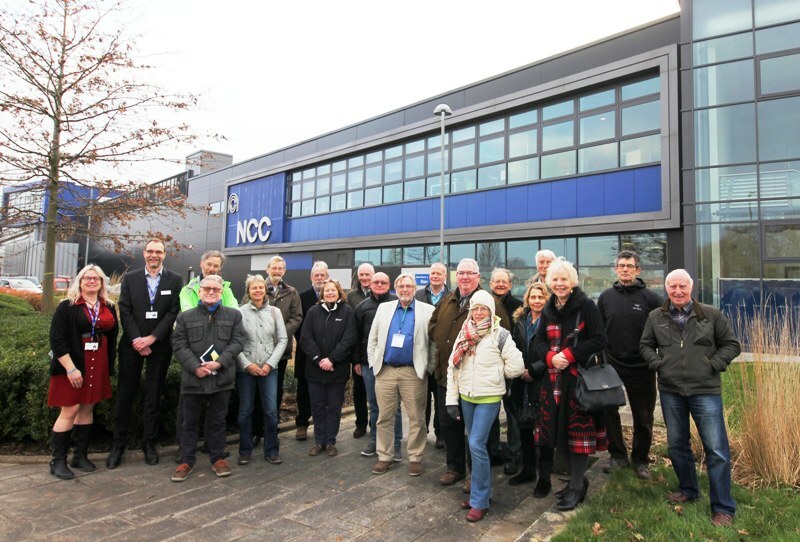 Thursday 22nd February: twenty Civic Society members were treated to a tour of the Bristol & Bath Science Park at Emersons Green. First, we assembled in the flagship National Composites Centre and were given an introduction to its exciting ambitions. The NCC is one of seven UK sites set up to stimulate growth in manufacturing. The initiative is labelled the High Value Manufacturing Catapult – ironic, in that a weapon invented in Greece in 399 BC gets a mention in the name of a futuristic scheme to investigate innovative technologies. Experiments take place with carbon fibre composites – they can be eight times stronger and one-and-a-half times lighter than aluminium. High-tech companies wanting to test materials ‘buy’ time here as they develop new products. It was all rather ‘Tomorrow’s World’ and the plant would have made a terrific set for a Bond movie. Really impressive kit: giant robotic arms which can lay down different materials with great precision. Autoclaves – huge ovens, or rather pressure-cookers – applying both heat and pressure to bond these materials and form extremely light but strong components such as aircraft wings. The tour of the plant was informative enough but we couldn’t view actual processes and I was instructed to take no photographs (but you can see what they’re up to at: https://nccuk.com/virtual-tour). Close by, the Forum and Innovation Centre serve ‘early-stage businesses and industry/academia collaborations’. Fledgling companies can move in and increase their space as they experiment and grow. It’s all about flexibility and collaboration. Certainly, a warm and informal working environment. Mary Page and Neil Appleton expertly guided us around the NCC, Tom Beasley welcomed us into the Forum and Events Team member Graham Egarr arranged the visit.